I love hats! I’ve been wearing them and admiring them on other people's heads forever. Growing up, my sisters and I were given new Easter bonnets every spring. My childhood favorite: a straw version of a Glengarry cap with two tartan ribbons down the back. I also remember seeing men wearing boaters and seersucker suits in the summertime. I thought that was a very cool look—I’d love to see it come back. Recently, I ventured into New York City on a very hot, very sunny day and was tickled to see so many over 50 women wearing hats. Click “read more” below to see some of the hats I saw on the street as well as a sample of hats available online. Quick: How many garments or accessories can you say are both fashionable and healthy? I can't think of more than one or two. The health benefits of wearing a hat are hard to resist. In fact, hats offer triple protection from those nasty UV rays. They protect your skin, eyes and hair. Interesting fact: I recently read that melanomas are most commonly found on the legs of women and on the backs of men. However, according to my dermatologist brother-in-law, a bad burn on your face can cause a melanoma anywhere on your body--hence, the need for regular full body screenings. And hence, the need to protect your face from sun damage. 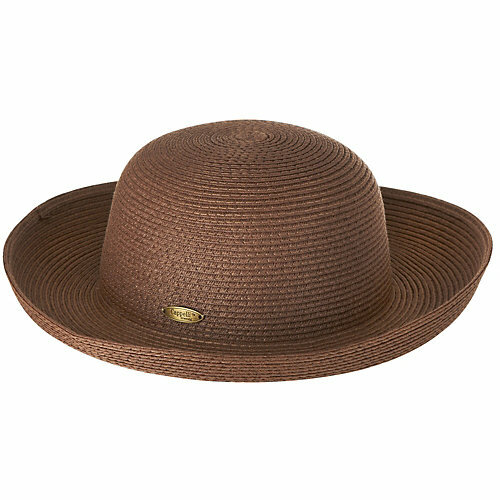 The most popular hat this summer seems to be the natural-colored straw hat. However, I did see some lovely colored straw hats like the one at the top of this post. 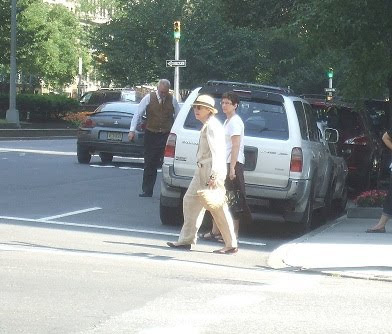 I also saw the random floppy canvas hat on the city streets. Both narrow and wide brimmed hats are popular this summer. 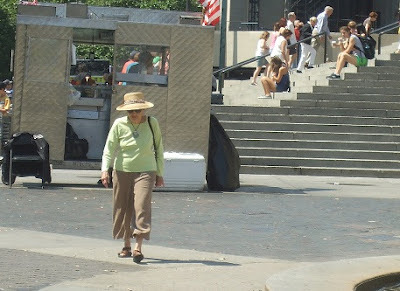 The narrow brimmed hats I saw were either a feminine version of the classic Panama hat or the Fedora (the Joe Friday-style hat). 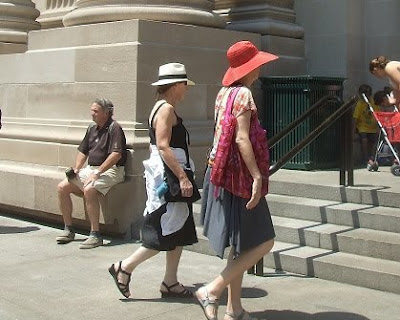 I love the way the woman below has paired a straw Panama hat with a beige summer suit. I saw plenty of straw hats with wider brims, too. These were more like a garden party hat or a Scarlett O'Hara hat. Fiddle-dee-dee! Here are two women in wider brimmed hats, one in a skirt and the other in wide-leg Capris. I think they both look smashing. 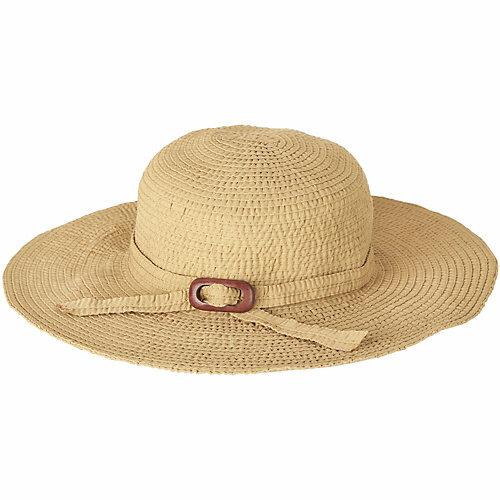 As you can see, the straw hat looks great with neutral colored slacks, dresses, Capris, blouses and skirts. 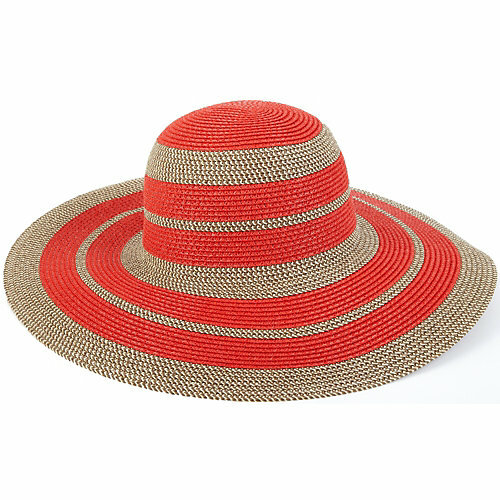 Here's a few straw hats I found on Beall's Online Department Store and Shopbop. As I'm sure you know, July is a great month to shop, since there are "End of Season" sales all over the web. Or...how about a super floppy brim?.